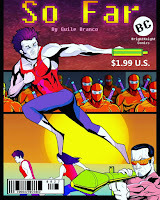 (June, 2016 -- Los Angeles, CA) So Far is the graphic story of the main character Malone (Guile Branco) and his intense battle with his violent, deadly pursuers. Displayed in both traditional action-adventure cinematic form, along with with highly stylized animation, and backed by Guile Branco's own strong-tempo music, So Far asks the question "When you realize you've gone SO FAR and there's no turning back, are you ready to face your fears?" 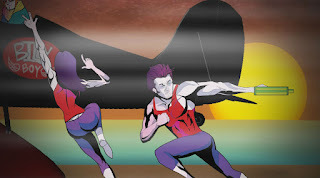 So Far is an action packed short film/music video produced by Guile Branco, directed by Gui Pereira with animation by Nic Raith. Guile and Gui are both huge action movie fans from Brazil, and have now been residing beautiful Los Angeles for many years. Writer - producer Guile Branco remarks: "When I first came up with the idea of So Far I knew I wanted to go way beyond a simple video music concept, I wanted to take it to the next level, and to be an experience! As a fan of action movies since childhood I wanted it to be a roller coaster ride! So Far incorporates animation to help make the storytelling method more contemporary, and also makes the film that much more visually stimulating, interesting, and memorable.
. . . I kept imagining these amazing action scenes . . . I'm really proud of it, and I want everyone to see it!" Director Gui Pereira's interest in cinema goes back to before he was even a year old! Gui has continually widened his horizons, at fourteen he directed music videos for his friends, at sixteen he enrolled a summer camp at the New York Film Academy. While in college Gui got a job as a writer for the tv show Take Unico for the Brazilian All-TV network, and most recently he graduated from the Los Angeles Film School, then from the Art Institute of California. "I've been working with Guile Branco for about six years now and I must say that he's the Johnny Depp to my Tim Burton. I truly trust him as an actor and I have the best actor-director relationship with him! It's always a pleasure working with Guile. I have to admit that when he pitched me the idea for So Far all I could think was: 'The guy has lost his mind!' Explosions, Ninjas, Car Chases! All of that with no budget at all! But I was up for the challenge! I trusted him and he had put together the best cast I could think of. We shot the entire film in just three days, and everyone gave their heart and soul. Guile is one of the best human beings alive, and his energy can get anything done. So Far is a proof of it!" He and Guile Branco have worked together on many projects over the last few years, including the multiple-award winning The Adventures of Sheriff Kid McLain, and Pizza Me, Mafia, with Brazilian tv star Tom Cavalcante, which premiered in the Paramount Theater, the largest theater on the Paramount lot. 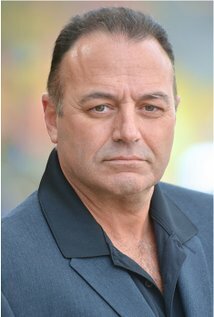 Lou D'Amato is an american actor of Italian descent and Co-Stars with Guile in So Far. . While studying acting at HB Studios in NY, he was fortunate to be accepted in the late Jill Clayburgh's master class "Working on/off camera". Lou learned so much with Jill he asked her if she would continue coaching him after the class ended and she graciously accepted. Lou is also a great admirer of Clint Eastwood both in front and behind the camera. Today Lou looks for scripts that encompass originality, something he says seems harder to find these days. 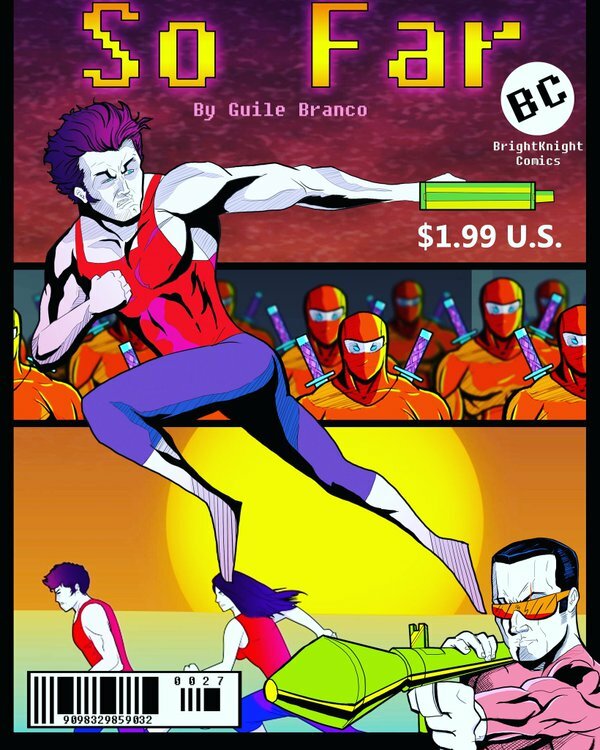 "Guile proves over and over how talented and committed he is to his work and his passion. So Far is a project that started in Guile’s mind over 20 years ago and it entails very personal aspects of his life from when he was young to today. Before Guile came to America, he not only loved stage and screen, but also was born with natural talents such as drawing/illustration and music. Recently Guile has been going back to his roots by writing and developing songs one of which is called So Far. When he was listening to the track at the studio, it was then he imagined that dream of his creating an action drama, but as Guile does, with a twist. He was able to incorporate his song, his illustrating prowess along with a perfect action hero story. This story is complete with car chases, machine guns, ninja’s and bi-planes oh yeah and torture. Watching how excited he got each time he would put pencil to paper to create his animated characters all while visualizing his story along with the music in his head was special. I’m so honored to be a part of this project and look forward to working with him on the next two projects (the prequel and sequel) which by the way, he already has it all in his head! He just needs to get that ole pencil out and start creating the magic that he does so well . . . "
"Collaborating with Guile to produce the animation portion of So Far was so much fun. It was a pleasure bringing his vision to life and being able to creatively express myself. The same goes for the fellow artists that helped us bring the animation alive and really made it their own. While animating we listened to a ton of New Wave music for inspiration and used retro album covers for reference. Our two biggest influences for the project were Duran Duran Album Covers and the Turbo Kid Movie. The trickiest part of the animation is the live action that cuts to the animation. We took screen grabs of the live action and drew them as animation. Getting the timing right for these shots was rough!" The So Far car chases were shot in beautiful Latigo Canyon, Malibu, known for its breathtaking views of Point Dume State Beach. The beach scenes in So Far were shot on the Point Dume State Beach, where scenes from many well known film and television projects were also shot, including the ending of the original Planet of the Apes, scenes in the Iron Man films, How I Met Your Mother, Angel, Modern Family, Scorpion, and even the original I Dream of Jeannie.